Our intention, at Rushmore Inspection Services, is to be respectful of your home. We know that having your home inspected can be an anxious experience not the least of which is having a stranger traipse through your house for a couple hours. We do try not to touch anything that we don't need to and we use drop cloths on the floor by the attic and crawlspace accesses when possible. Then there is the fact that the inspector is looking for defects and what will they find. Even I get nervous when a house I am selling is inspected. Below are some of the things that can help make the process go more smoothly and be less nerve wracking. Prepare your home. State law requires certain things to be included in an inspection. If an inspector cannot gain easy access to important components we will not be able inspect them. When this happens nervous buyers can feel that something is being covered up or hidden by the seller. Inspectors usually wonâ€™t and are not expected to move any of your personal belongings so make sure the following are easily accessible. Move everything away from all crawlspace and attic accesses, the furnace service and blower motor panels, the water heater, all of the electric panels, and the fireplaces. We take care to spread a drop cloth down but often there may be dirt or loose insulation that can fall out into the house when the attic hatch is opened so take your clothing or anything else out of the immediate area where your attic access is. Know that Rushmore Inspection Services is not here to kill your deal. We have no investment in the sale or non-sale of your house. We only report our findings to our client in the most honest way we can and try to document, as much as possible, with photos. No house is perfect and we try to help our client sort out what is a typical maintenance issue and what is something to be more concerned about. Sometimes an inspection will raise a question that will require further evaluation by a "specialist", like a structural engineer or pest control operator for example. This is not atypical and the additional inspections should be scheduled as soon as we know they are needed. If your house has stucco it may be Exterior Insulation and Finishing System (EIFS) and an additional inspection will be requested. This kind of siding can look perfect and have hidden moisture issues that can be catastrophic. It takes a special inspection to rule out hidden moisture issues. You can eliminate any anxiety on your end by having an authorized EIFS inspector inspect your siding and issue you a written report. You can present that to the buyer when they request the additional inspection. They may or may not want their own inspector but you will be confident that there are no problems. It is important that you use a qualified EIFS inspector as this is a highly specialized inspection. Your run-of-the-mill contactor is not qualified. Finally the crawlspace. Most people havenâ€™t ever looked in their crawlspace. This is one of the most important areas that needs inspection because of the potential for pest damage. It is a good idea for you to take a peek down there with a flashlight. If you canâ€™t see much because your insulation is falling down all over the place then the inspector will most likely not be able to conduct an adequate inspection of the area. It may also be determined that the insulation is falling because of a rodent infestation. If that happens it will be reported that visual access was obstructed and not readily accessible for inspection or unsafe to enter and call for the crawlspace to be cleared and made safely accessible. What that means for you is a re-inspection that the buyer may ask you to pay for. You can prevent this by looking in the crawlspace and having someone take care of the visual access and/or rodent issue. This has the additional plus of giving the buyer the feeling that the place has been looked after. 1. 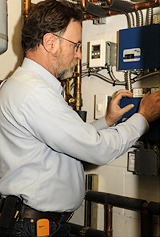 Service your furnace if you havenâ€™t in the last year and your house is over 5 years old. 2. Be sure to leave keys out for any locked areas or doors. 3. Shut down any computers that may be on GFCI Circuits. We donâ€™t want you to lose any data when we test the circuits. 4. Have all of your Ground Fault Circuit Interrupter (GFCI) outlets resets unobstructed. GFCI protected outlets have to be tested so if you have covered the reset outlet expect that you may come home to some outlets not working and needing to be reset. 6. Please keep your pets restrained or away from the Inspector or make arrangement for your pets to be at friends or relatives during the inspection. 7. Replace any burned our light bulbs as the Inspector doesnâ€™t know if the circuit is not working or the bulb is burned out. 8. Check your smoke and carbon monoxide detectors to make sure they work and replace the batteries if needed. 9. Clean or replace your air filters in HVAC and make sure the covers fit properly. 10. Clean around your homeâ€™s foundation and remove piles of wood that may attract and harbor pests. 11. Do those repair projects you have been putting off like replacing broken screens or window panes, replacing missing latches, knobs and such. Fix the downspouts or splash blocks and trim trees or bushes that may be brushing against the siding or eves. Take these actions and your home inspection will go easier and faster resulting in a cleaner inspection report - good news for everyone involved!